Take a spa break in Newcastle and you’ll be amazed by how much is on offer in the Tyne & Wear area. Whatever your tastes there are sights and experiences to enjoy across this county. You will find enough for the culture vulture, vibrant nightlife and fantastic shopping – making it perfect for any hen night spa breaks and it all comes with that famous Geordie spirit. Why not see if there is a sporting event on in the area or maybe a show in one of the many glamorous theatres. In you spa hotel you will be able to take some time out having a spa treatment on your midweek or weekend getaway. If your feet are worn out from shopping enjoy a lovely foot treatment or revive yourself in the sauna and steam room. Take a look at the Mercure George Washington Hotel & Spa offering superb deals on spa breaks in the Tyne & Wear area. 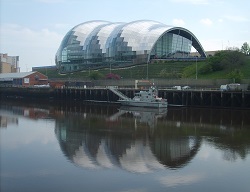 We have 1 night spa breaks and 2 night spa breaks available in Tyne & Wear plus spa days too. Please call us on 0800 012 2000 to check availability on any of our spa breaks.